Beatriz Milhazes, Gamboa 2 (detail), 2013-2015. Mixed media. 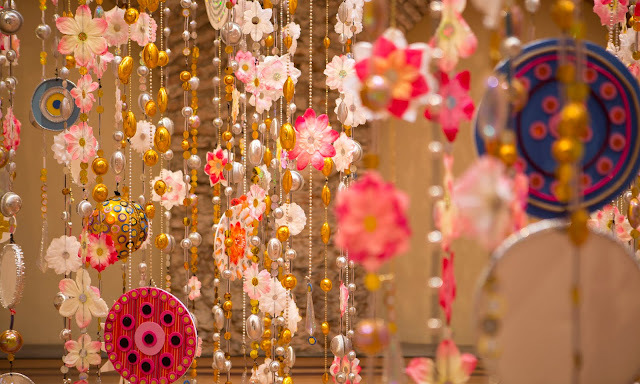 A newly created series of five hanging sculptures by Brazilian artist Beatriz Milhazes will be on view in the Jewish Museum’s lobby beginning May 6, creating a vibrant, colorful canopy overhead. Titled Gamboa II (2016), the installation is composed of candy-colored materials including plastic shapes, paper flowers, and other shiny trinkets, and produced with the help of Rio de Janeiro’s famed samba schools—whose craftspeople work year-round creating costumes, dances, and elaborate floats in preparation for Carnival. Milhazes’s work intertwines visual references to Brazilian popular and folk traditions, as well as its modern artistic movements such as Constructivism and Tropicália. Brazilian landscape designer Roberto Burle Marx’s Op art-style pathways for Copacabana Beach and the lush botanical garden near her own studio also influence her approach to line, color, and texture. Gamboa II is on view from May 6 through September 18, 2016 as part of the ongoing seriesUsing Walls, Floors, and Ceilings, which brings newly commissioned contemporary art to the Jewish Museum’s Skirball Lobby.